Certified medical professionals perform a complete medical examination in a nurturing and supportive environment on children who are victims of physical or sexual abuse. Our medical staff has been specifically trained to gather the essential physical, medical evidence, all while being extremely sensitive to the victim. The medical exam is conducted by a physician who is certified for such, assuring that evidence is neither missed nor compromised while it is recorded for later reference and prosecution. The Carousel Center maintains a non-threatening designated room for investigators to use the closed circuit video recording equipment. All interviewers are trained to ask questions in age appropriate ways while serving the needs of law enforcement, prosecution, and social services. During this process the child’s emotional and physical well being continues to be a priority. 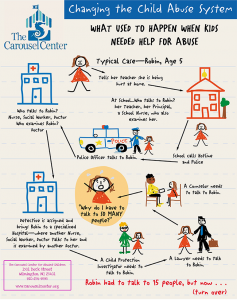 The Carousel Center provides child therapy services for children who have experienced sexual/physical abuse and/or neglect, so they can concentrate on doing the hard work of healing, and get back to the business of childhood. Carousel’s Team of therapists are experienced in working with children and trained in Trauma-Focused Cognitive Behavioral Therapy (TF-CBT). They provide initial clinical assessments to determine each child’s specific therapeutic needs and type of treatment plan for the child and their family so the can move into the future successfully. An on-site family advocate ensures that children and the non-offending family members receive needed services in a timely fashion. A fluent Spanish speaking case manager can be provided. Family counseling services and various types of therapy including traditional talk therapy, art therapy and play therapy are offered at the Center to children who have experienced sexual or physical abuse. Appropriate referrals are made to outside mental health providers if necessary. 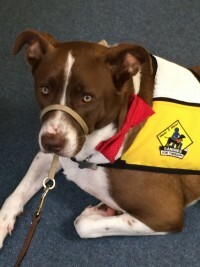 Our therapy dog Rudy is on-site to provide additional support to children and their families if needed. 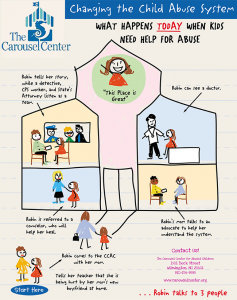 The Carousel Center is a facility affiliated with The National Children’s Alliance (CAC-NC). Our purpose is to provided a safe, caring environment for children who are suspected to be victims of sexual or physical abuse and/or neglect. We have forensic interviewers and medical providers on staff who are trained to collect necessary evidence, in the context of a Child Medical Exam (CME), for law enforcement all while catering to the needs of the child.